When I came back to Brisbane in the early seventies after working in Mount Isa for a couple of years, I had ambitions of travelling overseas. In order to save the money to do so, I found myself a second job. I worked in the evenings as a cleaner, emptying the wastebaskets, sweeping the floors and cleaning the urinals in the building we are seeing today, the Victoria Barracks. And, looking back, trying to remember details of what it was like, the thing I first recall is that I didn't have any ID like a pass or a badge, didn't have to go through any clearance procedure, and barely saw any sign of life in the place. Strange. It's probably different now, judging by the Keep Out signs and protective fencing. Here are some current images - ironically, I wasn't game to go inside! 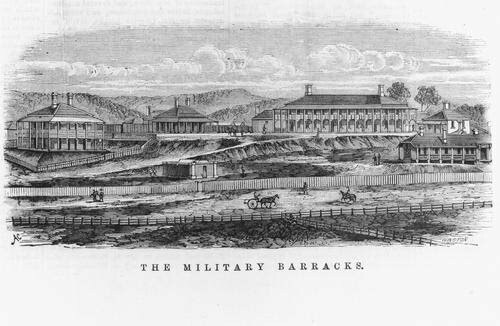 The first military barracks in Brisbane were built by convicts near the river in Queen St, at the site that is now the casino. When Queensland separated from New South Wales, the new governor of the colony was Sir George Ferguson Bowen, and he felt it necessary to have troops to defend Queensland against any invader. It was decided to build a garrison for troops on Petrie Terrace next to the jail that had been built by Andrew and John Petrie. The specifications had to come from London, and the barracks were constructed in 1864 by Robert Hope for a mammoth £6820. 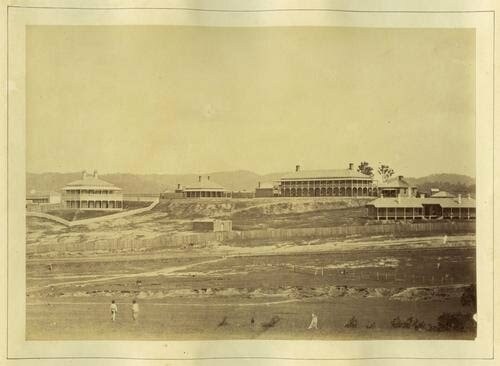 Here are a couple of early pictures of the barracks; the photograph is from 1868 and the drawing from 1872. The establishment was named Victoria Barracks in the 1880s to honour the monarch. Other buildings have been added to the site over the years, and it still operates as a military facility. These days it is mainly office space, although there are creature comforts such as an officers' mess and one of Queensland's oldest grass tennis courts. In a quirk of timing, my bloggy friend Hels has just posted a blog on Sydney's Victoria Barracks, situated in the Sydney suburb of Paddington. Take a look - it's worth comparing the two. Timing is everything. 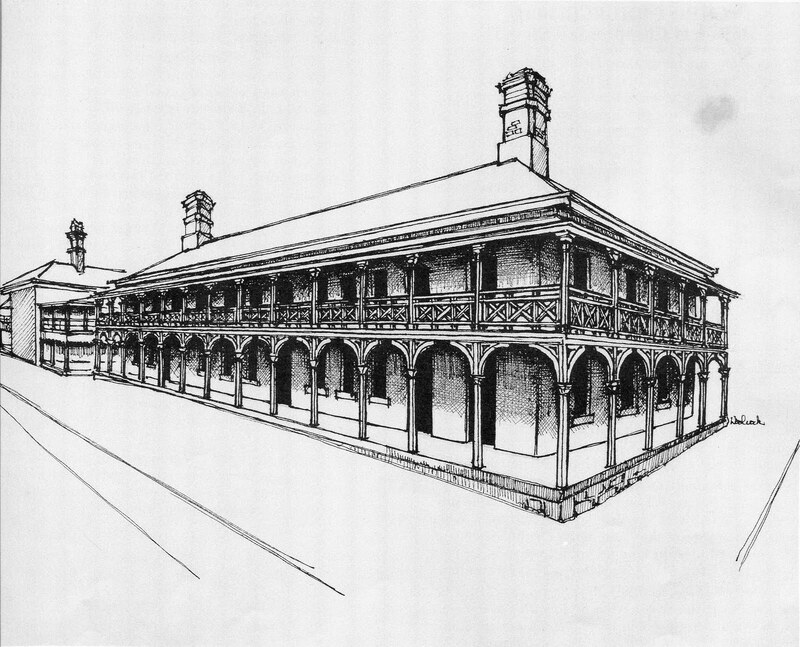 I had already written my post on Victoria Barracks in Sydney when I read your post on Victoria Barracks in Brisbane. The comparison struck me straight away. No probs - I enjoyed the comparison too.